Christmas update - look what I got! And yes, that is how it looks after three days of quilting in there! So far so miraculous! I've just noticed that one of the drawers is open. Could be becuase that,s' where I have stashed some of the Christmas chocolates! I am so glad that I hit on the idea of making a quilt sized to hide my dining room chairs. That quilt makes such a difference. In fact it is not quite finished becuase I ran out of thread with two strips to quilt! I don't want to put the lights away either - they make the place quite cosy. I shall have to source a pretty lamp of some kind. and, just one of my presents from Dennis.. 25 King Tut threads! Got to love a man who can not only source thread but knows where to get a discount on it! 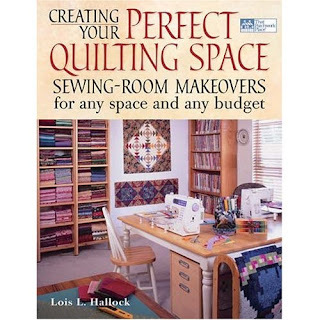 I am right in the middle of re-organising my quilting storage space. I have a big cupboard, half shelving, half hanging. I need to retain some hanging because that is the only place Dennis' coats can go. But most of the hanging is taken up with some suits and dresses I had tailor made in Bangkok at least 8 years ago if not a little longer They are in pristine condition, beautifully made to measure... the woman I was then! Some are of suiting material, most are of good quality Thai silk. They no longer fasten over my hips. I know that it is stupid to have them cluttering up this useful space. (b) Give them to charity - on the basis that no one is fooled by the diet plan and I should stop selfishly hoarding them because someone night need a good suit. (c) keep them downstairs but folded in in with the other fabric in the new boxes I am about to order on the basis that if my some miracle (a) happens I can wear them but if not I could cut them up and quilt with them. (d) get real and just chop them all up now to quilt with on the basis that whilst that might seem like a criminal waste I did pay for them to start off with and might as well continue to get money's worth from them? Normally I discourage posts about kids (being a grumpy childless-by-choice crone-to-be) but, since I only see my nephew but once a year and since this tale ends up being textile related, I grant myself an exemption. Neil lives in Northern Ireland. Last time I went he was keen to play board games. Not now he is twelve. His first question to me: "Does your phone have bluetooth connectivity?" It does and I am now the proud possessor of a Mr Bean ringtone ("I'm ringing, I'm ringing. It's in your pocket!) and some Monster Hamster hiphop MP3s. (Actually 'Country Roads' speeded up Pinky and Perky style with some backbeat but it makes for a very good alarm tone.) I am also pleased to say that my two year old Sony clamshell phone has officially been pronounced 'cool'. On day two of the visit he arrives at his Grans after Sunday School and comes sidling up to me. I am doing cross stitch and playing at 'how long can I put off the moment I have to go and lose at Playstation again'. (Does any adult understand what you are supposed to do on those games?) He asks sensible questions about cross stitch and gets a little explanation about how I am doing the City and Guilds course. He only rolls his eyes once when I ask if I can draw around his hand to use as a template for a fabric book inspired by Nelson Mandela. He has no idea who that is and even tolerates an explanation. Then his eyes light up as he realises he has the perfect way to get his Auntie's undivided attention. "Blue Peter were showing how to make sock monsters," he says. I crack under the charm pressure and send him off to get the requisite things. But we are short on cotton wool for stuffing and have to go down to the Spar to buy some. Despite the fact that at this stage my 12 year old style guru pronounced my coat 'embarrassing', the cotton wool winds up costing me £16 as mysteriously the bill includes a top up for his phone. ( This I do not regret as you will come to see later in this long tale). We return and he spreads his equipment on the table. I eye the pristine pairs of socks. "Will Granny let you cut these up?" "No," he says. "But if you ask she'll let you away with it." I ask May, my cool-as-BenandJerry's- MIL. She shakes her head in a combination of despair and resignation and we are away. "So," I say to Neil, "What were the instructions?" He shrugs. "I don't know I didn't actually see the programme because I was in trouble with Granny and she was telling me off." "Oh. So how do you suggest we make them then?" He shrugs again, "I don't know. You're the one doing the course." So, I get him to draw an impression of what a sock monster looks like. He draws an amoeba like blob with appendages and insists that it is a very different thing to a sock monkey. All he can recall is that you use the ribbing from the top of the sock to make a mouth. Ho-Kay then! We start to figure it out and the phone rings. He says, "OK" and "cool" a lot then puts it back down. "I am away to my friends," he says. "What, and leaving me to do the monsters all by myself?" "Aye. But I'll be with you in mind." Cheeky beggar. 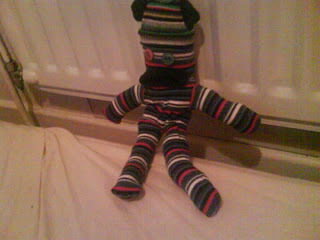 My prototype monster was a bit ropey. The second was better. I planned to blog about it. But blogs without photos are boring. Especially when you can't see the monster. But wait! All is not lost. I know a twelve year old. A quick request for a picture message from his phone and - voila! Un sock monster. Oh yeah and the photo of the crisps above was mostly so you'd keep reading, because I have this theory that more people read a blog post if there's a photo high up. 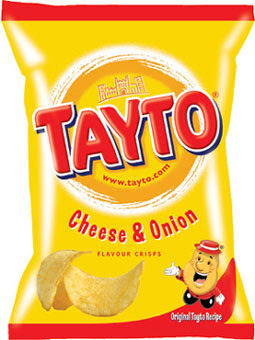 But also its there because the other reason it cost me £16 at Spa is because Dennis asked for a multi pack of Tayto cheese and onion crisps which taste of his childhood. He meant the 6 pack. I only saw the 12 pack and decided to be kind and get two. So that's him regressing for the next month then! I am not a download fan. I mean I down load Annie Smith's quilting podcasts but that its about it. However today I downloaded my third ever song ( the first being the Hollies version of Boulder to Birmingham, and the second being Kid's Rock's All Summer Long). Just occasionally a song gets into my head and I could happily play it over and over. This time it is Human by the Killers. But unlike the other two I actually have no idea what the song is about. Can anyone enlighten me as to what these lyrics mean?! It is a tradition for us to pay a Christmas visit to Bents garden centre. Not for gardening stuff but to view their Christmas displays, maybe buy a new decoration and then eat an enormous cake. The photos in this post are all from there. ( I picked that giant Vienese whirl on the second shelf) The meme has been doing the rounds so you may all be very bored with it but as I am full of head cold and can't be bothered being original I thought I'd join in. Anyway, sometimes it is nice to belong to a crowd! Chocolate - I don't even know what eggnog tastes like. The chocolate has to be Cadbury's made with milk by my husband. No one makes it like him. Does Santa wrap presents or set them under the tree? Well both of course. Where would the surprise be if they were not wrapped and how would you find them in the morning if they were not under the tree? Colored lights on tree or white? White. I do decorations as uncluttered and as un-tacky as possible. This year - today, but it varies. Up until my mid teens I thought that the proper day to put decorations up as Twelfth night, which is of course the night to take them down. But we always put them up on 12th Dec. Set in stone. It was ages before I realised that that that was because 12th was my Dad's birthday! So now it is never earlier than that but often later. I like the pickings of all the leftovers of buffet type food that I get to eat in the period between Christmas and New Year. Including Sour Cream Pringles. Yum. And, perversely, Matzoh which is a kosher passover cracker. Great with the pork based Ardenne pate! Until recently the big (BIG) Derby match in Rugby League between St.Helens ( my town ... "Come on you Saints, come on you Saints...) and Wigan ( ssssssss! Pie eaters!) took place on Boxing Day with the return match on Good Friday the venues alternating. Boxing Day meant dressing in as many layers as you could get through the turnstiles wearing. My cousins and all would go and we'd meet at the scoreboard end. One year my Grandma died just ten minutes into Boxing Day ( at home peacefully with family around her). We were all at the match that afternoon, red eyed and saying, "It's what she would have wanted." And it was. Sadly the season has changed now so the match no longer exists. I don't remember at all, but I may have contributed to some other children learning the truth when at the church Sunday School party I hit Santa. Well, he was my Dad and he tickled me when I was on his knee, what did he expect! Oh no, no, no, no, no. That's spoily! Gold beads, white and scarlet baubles, gold butterflies. Understated and matching! In fact our tree is small and false and every December there would be great stress and unkind things said as we tried to remember how to fit the base together. Then one year I realised that the secret of a happy marriage is to forget returning the tree to the box but instead to shroud it with a black bin bag and shove it up in the loft still errected. The next year we realised that you could do that and leave the decorations on. So now decorating consists of removing the bin bag, hanging one Christmas quilt, throwing another one over the sofa, setting out a Germanic velvet cloaked wooden based Santa on the mantelpiece, three ceramic snowmen on the fire base, two wire reindeer on the windowsill, plugging in a modern menorah and a set of lights in a vase and handing a heart shaped wreath on the hall door. Done. No arguments. Time for a Vienese Whirl! Depends if I have to go out. If I can stay in with the pickings ( see above) and a good book its pretty. But I hate to walk on it - I am afraid I may fall and break my teeth. I could when I was a student. I assume it is like riding a bike in that you never forget. My Mum used to look after an old lady and when 'Aunty Nancy' died ( I am sorry this is so morbid!) Mum got a very small inheritance which she spent on my sister and I. I got a 'music centre' as they were then called for my room. I was about 13 or so and felt very grown up indeed. My parents were actually quite good at anticipating things that we didn't quite know about yet but were about to get to the age of craving! The whole present opening thing has to be done with my little sister ( who is now 35!) and my parents on Christmas morning. Its no fun without Jen there. Then I like that 'blank time' from Boxing day on when there is time to use the gifts you receive and plan ahead for goals in the New Year. Being together for the present opening. Also getting Dennis an advent calender as although he pretends it would be OK if he didn't have one, the little boy who lives inside him gets very excited by them. This year I kind of lost track of time and between finishing work and coming home on 1st Dec visisted 13 shops to try and find one. (including the small newsganets staffed by an Iranian who had only been working there a week and had no idea what I was talking about). In the 13th shop I had a choice of High School Musical ones or the very last, slightly bashed ertzatz Winne the Pooh one. Phew. Next year I buy in August! Well they are OK but I never buy one. I'd rather gorge on Thorntons Dairy Butter tablet, a concoction of sugar and condensed milk. Ever recycled a Christmas present? Only in that nasty trinckety stuff will go straight to the charity shop. I don't have it in the house and no one who knows me well would buy it me if they thought on it so I feel no compunction to keep it if given me. Last night I was a dirty stop out. I met a dear (male) friend in Manchester who suggested we start the evening by strolling around the Christmas markets. Very festive and full of lovely German and Dutch food all of which I was persuaded not to eat in favour of dinner at a table rather than in the street. He also thought that a way to extract himself from the annual dilemma of what to buy a female friend for Christmas when you hate shops would be to invite me to choose something from the market. Lovely idea. Save that the only things I really craved was the whole tray of chocolate white mice. I love looking at painted wooden nutcrackers in the shape of soldiers but.... After a fun half hour or so he said tentatively, "I suspect this market is full of cheap tat." Then we went to Ithaca which he picked because all the stars who were at the MTV awards in Liverpool ( the one Paul McCartney played) came here for dinner afterwards. Of course all that means is that it was dark, black walled and overpriced. But the Japanese food ( which I have never had before) was artistically presented and delicious ( and to my relief, cooked!). We stayed out far too late then when I got back I was on a high and had to tell Dennis all about it and show him how those pallets in my yummy makeup box stack together. ( Oh, at 1am he was sooooo interested in that!) . So now I am knackered. I wasn't even drinking but I can't do these late midweeks anymore. We have to drive up to Cumbria now for me to work tomorrow, then see A Christmas Carol at the theatre in Keswick to celebrate Dad's birthday, Quilting class on Saturday and retirement celebration Sunday lunch at swanky Sharrow Bay. So I am busy doing what I do best.. making packing piles... a work pile, a quilting pile, a 'things for my quiting buddy pile' a birthday present, a things to do in the space moments pile..... good job a I have a big car boot! Well I am sorry folks. I promised you lots of photos of my sewing space but Blogger is refusing to let me post a single one so I shall just have to do that another time and tell you what I have been thinking instead. Which is that my problem is much less about space than it is about systems. For example, I do not have enough table top space in the dining room where I sew. So I end up with fabric scattered all over the table so after an hour or so it looks like a second hand clothes stall on a Ugandan street market. More ends up on the floor, or left on the ironing board which gets used as a second table ( and never put away because have to carry it all through the lounge and hall only to get it out again the next day). I need another table or eight. Or, just maybe, I need to learn to scatter less and fold more. Another example. I created a painting space in the garage where I could make a mess. I store all my art stuff there. The day I decided to spend some time drawing in a cafe I took a plastic box and put in some pencils and pens. That box is in my work case which is in my study upstairs. Why? Because its freezing outside and the very idea of moving the stuff outside makes me curl up with anticipation of getting cold. Only the box has no home inside so it stays lurking in the way. It is true that when it is warm I like having that dedicated space for sketchbook work - it puts me in the mood because I am physically 'in the zone'. Its true that I cannot dye or monoprint inside the house without endangering good furniture. But a system of 'winter storage' which allowed me to have a caddy for 'safe' art items inside might well enable me to stop putting off the sketchbook work I believe I would do if only I had a warm purpose built studio. I have a tendency to gather 'piles' .Stuff just accumulates. On the chair in the library. On the sofa in my storage room which is the second bedroom. In the Berber basket I use to carry the piles up and down stairs when I am in a more organised mood. On the drawers next to my sewing table. On the chairs behind them. On the coffee table in the lounge. On the wicker drawers in the bathroom.. well you get the picture! STUFF everywhere, annoying me. Not huge teetering, even- the -fire-brigade- could-not-get-through piles. Not even stuff that I should get rid of. Just a light scattering of stuff so the eye never has a clear place to rest. (a) I am blind. I put a item down and I don't see it. I repeat that twelve times and suddenly I see it - a pile of STUFF! (b) my head is too busy. Many piles represent good intentions. One pile may be for the magazines I am going to fillet and file the keeping stuff in my filing cabinet (already equipped with folders helpfully labelled 'applique' or 'bag patterns'.) Another pile is for sticking in a sketchbook in which I am designing a new quilt. Another is for a City and Guild project, another is to take to my Mum .... and so on. I can pile up much faster than I can do. I need a system for replacing items and to review if the use of storage is as ergonomically practical it could be. It is tempting to think that 'systems' mean expensive but cleverly designed storage systems from shops like A Place for Everything. In fact in the case of my storage cupboard it might well have a little do do with that. A good part of the room in there is behind a solid wall so it is hard get to and the two bottom shelves are very deep indeed so its hard to do more than, well, create teetering piles. In fact on one shelf I have piles of three high storage boxes for scraps. In theory it is a good system - one box per colour. In practice it is bad because if I want to add a teesny bit of say blue to the box I have to life two boxes off the top. And these are Ikea boxes with those lids that kind of just sit there and don't really make more than a token effort at clipping on. So when the scrap box get a bit full the lid comes off. An elastic band solves the problem but then that has to be removed too and oh you know what? Lets just shove the fabric in the vague direction of the bottom blue box and be done. I am thinking that drawers may be better. Or Really Useful boxes which have much better clip on lids. Or, how about I forget about furniture and start using scraps up before the lids start coming off the boxes?! I am a great believer that if you have a problem to solve there is probably a book about it. Indeed I have just paid a penny for Julia Morgenstern's Organising from the Inside Out. The best that will happen is that she will teach me how to stop being a blind, lazy, disorganised over-optimistic person. The worse is that it can go on the pile with the Studio Magazine back copies. 1. 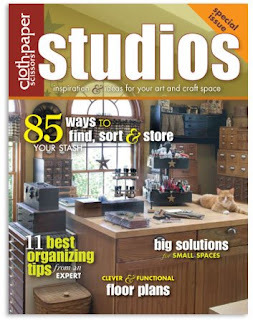 Amy Giles has her very own play shed featured in a Studios magazine online extra. 2. Virginia Spiegel cleaned up and organised her studio here. Then messed it up again here. 3. Msueh has posted an album of her quilting studio - she even has a woodburning stove in there to keep it warm. Then I realised this was a pointless task because I found two huge lists already done here and here. Go enjoy! Continuing the tale of lust and envy of other people's studios and greed because I am not satisfied with my own space, I have begun to develop a fetish for looking at other people's studios. 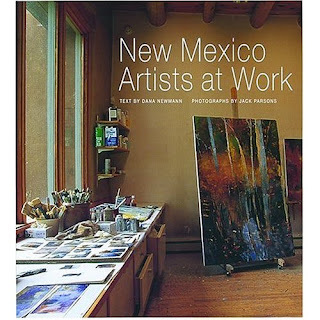 Then, Browsing Amazon I was reminded of this book. Which was bundled with this book. 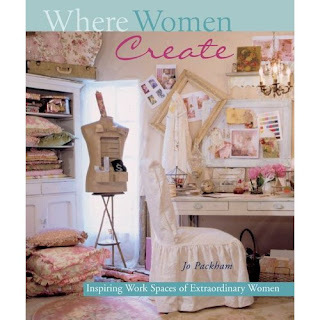 Then, searching for blog reviews of the Where Women Create book I found that it is now a quarterly magazine from Stampington! Now the exchange rate has plumeted it is a very costly magazine to get over here but look! 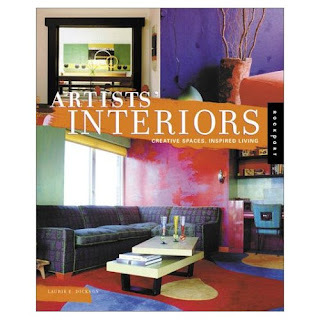 It has 160 pages of other people's cupboards. Look! All those pictures of what other people have done with space I do not have. Look! Oh I want it so badly. So, before I bankrupt myself I need you all to do me a favour. 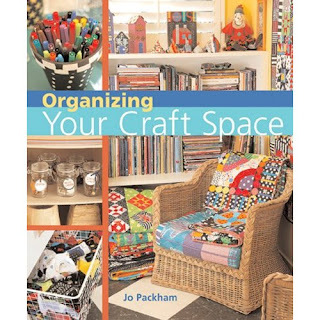 Blog about your creative space and leave a comment her showing us all where the post is. I need to be brought down to reality whilst at the same time satisfying my voyeuristic nature. Most of us do not have photo-shoot worthy spaces (and if you do I most certainly want to see it). I do want to see ( if I pretty please may) where you all do your stuff. 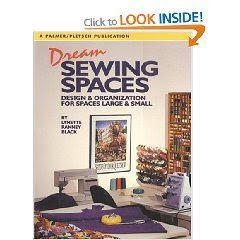 Thnak you all for your comments showing links to your own sewing space studios. I have enjoyed peeking. However, it occurs to me that for all my pontificating on this topic I have not recently shown my sewing space although I have in bits in the past. I shall do a comprehensive post with photos then leave the subject alone I think. (If I can) Assuming you want to see? I am not sure whether this post is about envy or lust or gluttony but it is definitely about Studios. And probably sloth as well, as it has taken me until this week to file away several piles of quilting magazines and clippings I have accumulated. One of them was Studios magazine. Now this edition of the magazine was discovered with great delight in London after I had refused to pay postage from the States even though I really, really ( oh believe me, really) wanted what is in effect a collection of glossy photos of other people's cupboards. I read it on a train. I gazed dreamily out of the window imagining. I arrived home and set it to one side. Then I found it again. Now, Really I am lucky. I have lots of space to sew and store and even design. But it has its drawbacks. The storage is upstairs, the painting and dyeing is in the garage and the sewing is in the dining room. This latter has the great advantage that our very large dining table is just wonderful for supporting a bed quilt when machine quiting. The problem is that dining room tables come with dining room chairs. I have shoved ours out of the way under the window. But they still annoy me sitting there reproachfully reminding me that this is a dining room not a purpose build designed 'Studio' with those beautiful nooks and crannies and window seats with clever understorage. So when I picked up the magazine again I went into overdrive. All those wonderful spaces to crave. I removed Dennis from in front of the TV and made him listen to my crazy ideas. Put the chairs in storage ( I.e pay for the privilege of driving 10 miles to get them every time we want to eat at the table). Put them in the loft (I.e scratch them - and probably each other - to bits, manoeuvring them up and down a ladder into a tiny hole in the roof). Put them on Freecycle and eat Japanese style. ( But the table is normal height). Make a room screen to hide them. (Cue Dennis trying to hold up a large, curling sheet of Pelmet Vilene so I can imagine what it would be like). Conclusion - makes the room even more cluttered. Bah! I want ( imagine stamping of tiny feet) I want, I want a space where I can display some of my work and I want a place to loll with my notebook. I want to have the room more colourful less formal. I want more downstairs storage without being cluttered. Part 2 of this tale comes tomorrow. 1. The trees are trees of life made out of Star of David shapes symbolising the continuation of the Jewish people and the foundation of the State of Israel. They are much larger than the train tracks entering Auschwitz which would have been the last journey Salka's family made. I hope the trees have a defiant nature. The tracks now run to a patch with a quilted Star of David on it. You may see this as a reminder of the yellow star patched Jews were made to wear. Indeed if you look closely you will see a tiny smudge of yellow which is why there is a patch and not just a star because something had to hide the marker that for the first time ever refused come out! Or, you may try to see something positive and view the tracks as symbolising the Journey Salka's family never did make but which others made to establish Israel. be rooted in something. 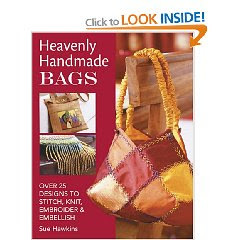 The bottom strips are based on the edgings of the traditional prayer shawls. Orthodox men wear undergarments with knotted fringes which hang out over their pant belts. These fringes are known as tzitzit and represent the 613 commandments. I have not made that many but that is what the tree roots are. 3. The tiny beads on the trees represent Salka's family - some , stemming from the woman who listed her many deceased family members at Yad Vashem, remain on the tree, others are falling to earth. 4. The gravestones are crooked just like old surviving Jewish cemeteries in Europe. The words are the Jewish mourning prayer the Kaddish photocopied from a prayerbook onto Bubble jet soaked fabric. It is the photo not the created fabric which is a touch fuzzy. Still to be added is a small brown bead on top of one of the gravestones as a traditional Jewish mark of respect is to place a pebble on the headstone. I always do that when visiting a Jewish cemetery. The quilting is simple lines further fragmenting the crazy pieced background to represent the diaspora and the scattering of families caused by the Shoah. By the way - I am not actually Jewish, but I do have a strong interest in the Jewish faith and people so I hope I got this all right! The next finished piece for the City and Guilds is my quilt. I am going to do a double size, based again on Egungun masquerade costumes and the research on masks I have been doing. 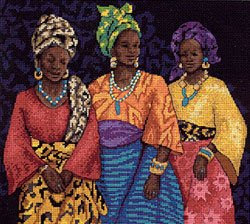 It is all going to be made with my collection of fabrics from The African Fabric shop. (the pre- washed ones for those who read by Quiltland blog). I am so excited about starting it I can't actually start it! I am waiting until I am not tired and have a big swathe of time and can really enjoy it. But here are the fabrics all ironed and arrayed ready to start. Sometimes I do really stupid things. But generally I am not stupid enough to reveal them on this blog and today is no exception. However, if you are disappointed at my lack of revelation, you might like today's' Quiltland Chronicle post. And while you are blog surfing check out the 1st Deecember reveal on the Twelve by Twelve blog. Our mathematic quilts are now out and we'd love your comments. There was a time when the plan for each Saturday involved carefully dressing then catching the No 23 bus into town with my best friend Lisa. There we would buy Constance Carol eye makeup from the markets stall and purchase a Gregg's meat and potato pasty to eat from the paper bag whilst walking around the streets eyeing up hair accessories and pocket money clothes. Now it is not possible to buy a Greggs meat and potato pasty because the EU regs say that because of their relative meat content they have to be called potato and meat pasties. They only time I frequent the market which now seems sadly seedy is when I am in dire, dire need of haberdashery and can live with the low grade quality of the stall there. I am ashamed to say I have no idea which number bus goes into town from here. Instead I drove in this weekend and faced the theatre of war which is Tesco's car park with drivers who will steal a spot which you are indicating to drive into as quick as say, "Santa Claus is coming to town'. I tried my best not to knock over all the old people who seem to think it is their right (because they fought in the war) to walk directly behind my reversing car. Then I went to shop in the laundry section of the supermarket. Came away with this though and guess what - I am as happy as I was with my first goopy mascara. See that doo-dah thing by the iron rest? Its a place to hang binding strips as you iron them shut. What more can a girl want? The renamed pasties still taste good too!